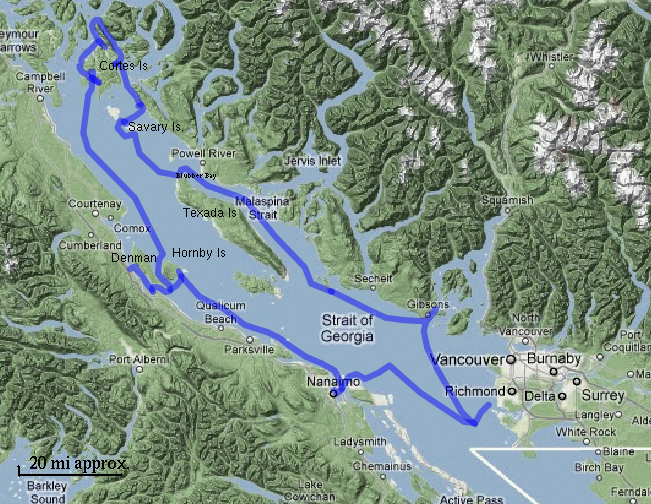 Fueled at Steveston (+ ice cream as usual), then sailed to Plumper Cove (near Gibsons), arriving about 21:30 in the dark. Made a mistake with the depth sounder - maybe got the wrong scale - and "anchored" in 25ft which was probably more like 100. Should have trusted my recollections of the cove rather than the instrument - drifted towards another boat while cooking supper. Moved to shallower water when they hailed us to complain. Set off about 08:30 - only way to cover distance is to get under way while the crew are still asleep, before breakfast. Not that 8am is exactly early - most of the dew's burned off. Excellent sailing; a good run up inside Texada with the wind behind, goose-winged at 7kn. Later the wind slackened somewhat and we put up the spinnaker to keep up the speed. Put into Blubber Bay at the north end of Texada about 18:00 - about 95km as the crow flies, or maybe 120km sailing. Watched a DVD on the laptop, then turned in. Blubber Bay provides some shelter, and has a ferry dock and a wharf for, I think, a quarry operation. We anchored near the remains of an older wharf. Not much wind. We motored towards Savary Island, pausing to do a Man Overboard drill. It was pretty warm and everyone took turns jumping in, or pretending to be knocked out. Even myself, trusting my daughter to come get me. We tried to make a video, which is not so easy on a small boat, especially if you haven't done it before. We needed to get to the North-West corner of Savary, so we carefully crossed Manson Passage. This was about 10ft deep most of the way, but rose to about 6ft at the far side. It's a sand bottom - pretty forgiving if we had bumped. Last time we were there we'd gone well and truly aground, so I was a bit more careful, setting a stern anchor to deep water with the bow in about 11ft. We all went ashore to visit friends on the island, and returned in the dark with the aid of a flashlight. Deep water is a few hundred metres offshore, and there's a bit of a current when the tide turns, so we had to be careful rowing back. In the night the wind got up somewhat, and there was quite a bit of banging - I think waves hitting under the stern as the anchors would not let her come bow-to-wind. In the morning it had calmed down again. We went ashore again and stayed for lunch, then set off for Copeland Islands (marine park). The alternator belt came apart, but we had a couple of spares so no problem. A quiet night tucked behind the islands. Went rockhopping along the shore but had to turn back after a while - too hard without climbing gear. The islands are undeveloped so there weren't many paths, either. Another boat anchored next to us had a bit of engine trouble just as they were going to depart and ended up tied alongside for a while, before re-anchoring and heading off to Lund to look for parts in their runabout. We departed for Squirrel Cove around lunchtime, with a bit of wind. The autopilot stopped working, but fortunately it turned out to be low voltage on the house battery, rather than anything more serious. Put into Squirrel Cove for groceries, and bought a new battery. Anchored for the night. Hauling the anchor seemed a bit harder than usual - sure enough, up came a length of rope caught on it. Probably someone's old anchor line - there was a wrecked wooden boat decaying in the shallows, too. We set off North heading aroung Cortes Island. There was another sailboat flying a skull-and-crossbones we kept joking about and pretending to race. The wind was fairly light, but Alastor had more sail area and made better speed most of the time. Finally the wind died after we had taken the tip of Cortes wide on a starbord tack, leaving the "pirate" easily the victor. After a bit of light-airs sailing, we got fed up and started the engine, heading to Van Donop marine park. Near where we had anchored, there was a shallow rapids to an inlet with a small island in the middle. I paddled the windsurfer through, thinking I'd be able to return with a bit of effort, but the current was too strong so I had to wade through the shallows towing the board. After I got back to Alastor, the children shot the rapids with the inflatable and I returned on the board, this time with wetboots. They had fun towing the dinghy upstream and drifting back a few times, before we went on a circumnavigation of the island. On the other side of the island, there was a smaller island with an abandoned canoe. For fun, I left the board and paddled the canoe to meet the dinghy, and Mel helped paddle the canoe back to retrieve the board. That left two of us to paddle the windsurfer in pursuit of the dinghy. We promptly capsized and got somewhat wet; meanwhile, EK and Petri had rowed off back around the island. So we had to carefully paddle the board all the way back to Alastor, trying not to capsize again. The tide had turned by this time and the rapids were in slight outflow. No wind. Motored to the Gorge, just for a look (the entrance is narrow with a cliff on one side), then headed to Mansons Landing - which on the chart looked like it might have some kind of settlement. But it doesn't, really. There's a government wharf and a few houses, but no store. We anchored south of the wharf in about 16ft near the shore, with a stern anchor. During the night it continued calm, and we very gently went aground without anyone waking up until it was too late. (the next day we met an ex-Nic owner who said "Oh, everyone goes aground there". Apparently the current pushes boats ashore, and we had too much slack in the stern line to prevent it). We had stupidly left the washbasin stopcock open in the bathroom, and while we were quietly in bed trying to get back to sleep, pretending that everything would be better come the morning, Alastor was slowly filling with water lapping over the edge of the bathroom cupboard. Not enough to be a real threat, or even fill the bilges, but enough given the angle of heel to soak the edge of the starboard berth mattress, the sleeping bag, and EK, who was by this time lying against the hull. When I had gotten up to check on things earlier I had quickly closed the stopcock but it was a bit late - there was enough water aboard to come through a cable opening in the bulkhead. So I got dressed and went off in the dinghy to reset anchors, leaving EK in the dry portside bunk. Fortunately, the sun came out, so we put the wet bedding over the boom to dry. The foam mattress had got wet on one edge, water coming through the zip and vents, so we took the cover off and laid that out to dry, too. We then set off on foot to the village a few km up the road, visted a small bookstore and supermarket, and had lunch in the restaurant. After lunch, the children went swimming and we motored to the Gorge for fuel, then anchored overnight. More Man-Overboard drill. Petri went up the mast with the camera to try for a birds-eye view. Little wind. Motor towards Hornby Island, then decide to visit the Denman Island Chocolate factory. Call them on the cellphone - there's a tour the next day. Go around the South end of Denman and back up the channel to Big Bay; anchor for the night. Anchor near Denman Island Ferry, stern line to ruined jetty. Head off to the chocolate factory after lunch, but take a wrong turn and arrive a bit late. The "factory" is in a regular house, no big signs or anything. They buy raw chocolate from Europe, add flavourings and repackage it in bars. You can find it in many small stores here. Denman Island Chocolate - the wrapping machine, the "factory"
Buy some chocolate, a couple of T-shirts. Stop off at a cafe for sundaes, get some groceries. Head to Fanny Bay on Vancouver Island to pick up Suz and Oreo (1 yr old border collie). Since we have plenty of time, we try towing Alastor across with the dinghy. Abandon the attempt when the tide starts pulling us into the shallows. Moor alongside a home-built ketch (nicely done); Suz arrives about 9pm. Stay overnight at the dock. Dire warnings from various people about depth, shallow bits etc. but it looks OK on the sounder and we have no problem. Low tide, but again no problem getting out. Sail/motor to Tribune Bay on Hornby and anchor. Go ashore but miss grocery store (closed at 4pm for end-of-season party). Buy some books at a little bookstore in the market. Overnight at Tribune Bay. Take Oreo ashore - he's not so keen on the boat at first, but starts getting used to it. He jumps overboard from the dinghy and swims ashore - proves he can swim, anyway; he's always stayed within wading depth before. Go ashore and get to the store when it's open; buy groceries etc. Kids go swimming. Sai/motor back to Fanny Bay to drop off Suz, Oreo and Petri, then move to Big Bay for the night. Look for fuel at Big Bay. One guy says there's a gas dock, one says there isn't. Finally find there isn't, but there's a fuel pump on shore by the store with a long hose. However, it's low tide and the pontoon area is much too shallow for Alastor. Take a jerry can on the windsurfer and fill it up. Go ashore on Newcastle Island (marine park). No rabbits - wonder where the've gone. Head across to Nanaimo to buy some petrol. There's a bit of wind, but it's against us. Sail for a while out past Entrance Island, then motor to Sand Heads and back to Ladner. The sonalert (beeper) kept going off every few seconds. I thought that I'd wired it across the ignition light, implying that the battery wasn't charging properly (certainly, the house battery seemed to run down more than usual, although we had replaced it). Later investigation showed that I'd actually wired the sonalert across both the oil pressure and ignition light with diodes to give an "or" function. It was actually the oil pressure warning - the oil level was low. Fortunately it didn't actually run dry. I'd forgotten what colour the lights were. Also, it turned out that the ignition light was disconnected since I had replaced the original alternator some years ago (for insurance purposes, the surveyor said we had to have a sparkproof unit). I took along my Nokia tablet with Maemo Mapper as a backup to the Garmin GPS. There are no commercial charts that I know of for Maemo Mapper, but I had converted some of the (free) US raster scan charts. Unfortunately, they don't extend very far into Canadian waters at large scale, and we had headed North away from the US. I had also scanned some Canadian paper charts and converted those, too. The area around Savary Island worked quite well. (My Garmin is a small handheld with a monochrome screen, while the tablet is still a handheld but has a larger, colour, screen and a faster CPU). On December 23 we joined the Carol Ships in Vancouver for the "Parade of Lights". Meaning we dressed Alastor in fairy lights and joined a number of other boats motoring around False Creek playing carols. At least, we were all encouraged on the website to play carols, but I didn't hear anyone except my crew, who played horn on the foredeck. It was quite calm, the deck light worked for once, and they were able to play comfortably with a music stand. I strung LED outdoor lights hoisted with the spinnaker halyard, and another string around the lifelines. The lights were run from a 110V inverter from a spare 12V battery.